When it comes to planning a home improvement project, chances are that you are wanting to approach the task in a planned, informed manner. Today’s choices of materials and styles can put a lot of pressure on homeowners to make the right decision for their home. One way to make the process easier is to speak to your local home design superstore. The Shelby Design Center is proud to be your go-to lighting and flooring store in Shelby, providing expertise in addition to our expansive inventory. Our 20,000 square-foot flooring showroom is stocked full of unique designs from across the country. Comprised of Lighting One© and Carpet One Floor & Home© cooperatives, our flooring store in Shelby is able to deliver more inventory at lower prices. Consumers can choose from a wide range of materials, including laminate and hardwood flooring. 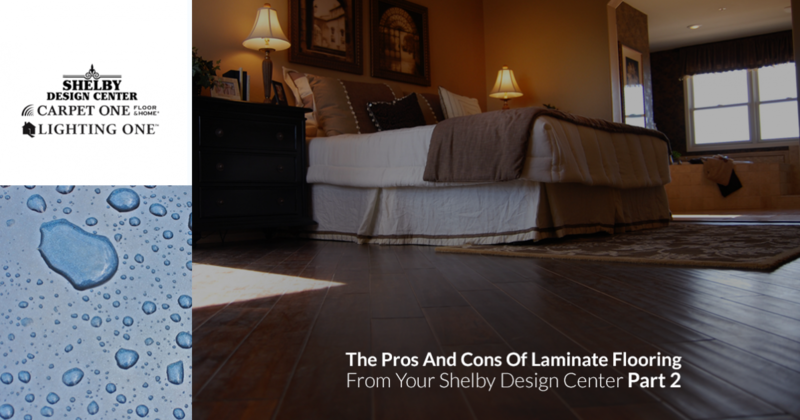 Today, we’ll continue to look into the pros and cons of laminate flooring by starting with a few of the drawbacks. While every flooring material offers a unique blend of goods and bads, no option is perfect. If you’re in need of expert assistance, be sure to stop by our all-in-one design destination! Moisture Issues. H2O can be a very destructive force in the home, causing rot, mold, and more. While water damages can wreak havoc on your hardwood flooring, the composition of laminate makes moisture problems even worse in comparison. The main reason here is due to the composition of laminate flooring, which consists of high density fiberboard (HDF). This composite material, when exposed to too much water, can begin to break down and fail entirely. Once your laminate is compromised, the only option is replacement. It’s important to be mindful of moisture issues. Homeowners can take steps by installing a moisture barrier underlayment, only placing laminate in rooms without close contact with water, and so on. Installation Complications. While placing your laminate flooring is easy, it’s not foolproof. Experts warn that the start and finish of your flooring process is more difficult than many realize. The result is often floors that are not aesthetically pleasing, smooth, or functional. Be sure to take the time if installing the materials yourself, or budget for a professional to get the job done. Repair Measures. While laminate is built to be scratch-resistant and durable, the efforts needed to repair any damages can be a hassle. The higher cost of hardwood flooring does come with benefits, such as being able to refinish your floors multiple times to restore them to quality condition. Laminate, on the other hand, is difficult to work on. Oftentimes, homeowners are choiced with replacement materials. Your laminate will create a floating floor, meaning that it is not secured by glue or staples. When installing your floor, it’s important to focus on following procedures perfectly to avoid future headaches. When the planks are crowded and pushed together, the combined pressure can cause the joints to rise up, also known as peaking. While this problem can be worrisome, remedies are available to relieve the problem. Gapping, or the process that is the opposite of peaking, consists of your planks pulling away from each other and interfering with the strength of the connecting joints. Oftentimes, this is due to excessively cold weather, causing the materials to shrink. Buckling is a third problem that is seen in laminate flooring, which occurs when your laminate is exposed to excess moisture. It’s vital to correct water damages as soon as possible to prevent mold and further repairs. Laminate flooring is quickly becoming a top choice in this country for consumers who are looking for a material that is versatile, durable, and affordable, but it isn’t without some drawbacks. One smart way to ensure the best outcome for your home renovation project is to work with your local flooring experts for assistance. Anyone in need of a flooring store in the Shelby area can benefit from visiting the Shelby Design Center. Featuring 20,000 square feet of quality fixtures and materials to best meet the needs of your unique home. Contact us today or stop by our store for assistance!